Who doesn't love a good body scrub??!! Your skin takes a daily beating and we often times overlook caring for this vital organ. Yes I said organ! Did you know your skin is your body's largest organ of detoxification? With proper care and exfoliation you can keep your skin both healthy and glowing! There are many ways you can create your own body scrub at home for very little money and they also make a great gift for the holidays, as a hostess gift, or for a birthday. And these scrubs are not just for women! You can make a nice scrub for the man in your life and let him enjoy the benefits too. These are 3 of my favorite scrubs ad they are all very simple to make. When thinking of making a scrub for yourself you can focus on what type of smell and feel you are looking for or you can focus more on the health benefits you are trying to achieve. I've included recipes for both below but get creative and come up with some fun combinations! This recipe is a great invigorating scrub to increase circulation and coffee has also been known to be great topically for helping reduce visibility of cellulite with the addition of coconut oil to hydrate the skin. Mix all the ingredients together thoroughly. After you've washed your hair and body, massage the scrub on wet skin and rinse with warm water. This body scrub is great for an invigorating morning scrub. Grapefruit essential oil is detoxifying and cleansing and known for its lymphatic cleansing abilities. Mix all ingredients together, and pour into a lidded jar. Wet your skin in the shower, and gently massage the scrub all over yourself—preferably in gentle, circular motions—to exfoliate it. Rinse thoroughly, pat dry, and moisturize if necessary. 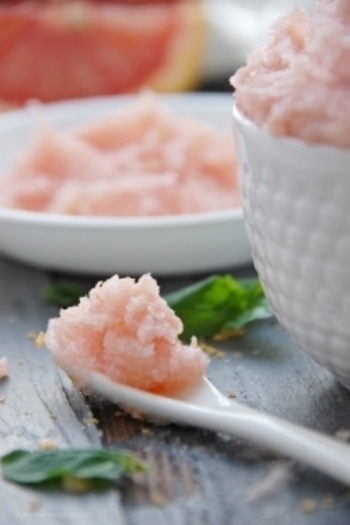 This is a great scrub to help relax and soothe before bed or when you want to wind down. Mix all ingredients in a glass bowl. Start with 1/4 cup oil and increase a tbsp at a time until desired consistency is reached. You don't want the scrub to be runny, but the sugar should be soft and saturated with oil. Test on the back of your hand if needed. Start with 5 drops of lavender oil, adding up to 10 to get desired scent. Scoop into jar and store out of direct sunlight. (Use glass jar/container or PET plastic if using essential oils.) Add label and tie ribbon around the top if giving as a gift.